"Chicago-style politics is front and center. When a sitting president has his roots in this sullied political heritage, it makes for news and leads to speculation. NOT BLACK AND WHITE is a fictional account of many of the events that led to the meteoric rise of a local charismatic street politician to become America's first African-American President, and the downfall and imprisonment of two consecutive governors of the State of Illinois, along with several of their most trusted advisors and cohorts. This story puts the reader inside the campaign offices and smoke-filled back rooms where political deals are made. It depicts the rise and fall of a Syrian immigrant who made millions by pretending he had billions, while charming his way into the highest halls of wealth and power. 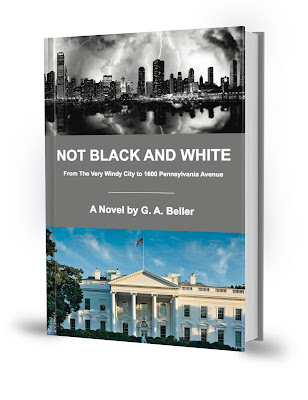 The perspective of a local attorney/businessman who found himself in a front row seat to politics-as-usual in The City That Works is reflected throughout the story. The cast of characters may appear familiar to anyone who ever read a headline or watched cable news and talk shows across the country. In 1994, a freak traffic accident occurred, killing a family of six young children when their van burst into flames after being struck by a semi-trailer truck driven by a man unqualified to drive such a vehicle. The truck driver, a victim himself, had bribed an employee of the Illinois secretary of state's office in order to procure his commercial driver's license. The tragic accident and resulting exposé of corruption and scandal that followed changed forever the course of American History. Inspired by true events, NOT BLACK AND WHITE leaves it to the reader to interpret fact from fiction."